So wrote the French philosopher Pascal in the 17th century, and his words are quoted by one of the monks in this solemn and engrossing film. 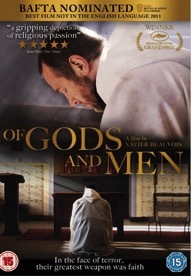 “Of Gods and Men” is based on an event in Algeria in 1996, when eight Trappist monks were taken hostage by terrorists. The film centers on the fact that the monks could easily have evaded this fate but chose not to. Roger Ebert, in his review of the movie, states that the Brother Christian, "should have had the humility to lead his monks away from self-sacrifice...It is egotism to believe their help must take place in this specific monastery...Are they committing the sin of pride?" How would you respond to his claims? Should the monks have engaged in more political advocacy? Were they really helping the muslim villagers? How did the pacing of the movie augment or distract from the narrative? Describe any visual scene or piece of music or dialogue that particularly impacted you. Do any scripture verses or bible stories come to mind after seeing this film? Any verses from the Koran? Which of the monks do you identify with most? Why or why not? How does the movie's portrayal of the monks' singing and praying affect your experience of the movie? The elderly monk Luc quotes Pascal: "Men never do evil so completely and cheerfully as when they do it from a religious conviction." How does one guard against doing perverse evil in the name of God? How did you experience 'The Last Supper' scene? Under what circumstances, if any, would leaving the monastery have been an act of faithfulness and not cowardice? How was a sense of community formed through their decision-making process? Is it the same for us, living in less dangerous conditions?